Food packaging serves many purposes, from protecting the food to creating portion sizes to offer information on the product. However, what is not well known about food packaging is the different types of packaging available. There are nine types, and are described below. This is for foods that are sterile and are to be maintained sterile. These items include liquid eggs, milk and milk product drinks, along with other foods that are processed and need to be preserved for longer periods of time. Aseptic packages are made of a mixture of paper, polyethylene, and aluminum and contain a tight inside layer of polyethylene. Sterile pharmaceuticals are mostly packaged in plastic or glass, such as syringes and vials. This is mostly self-explanatory. Trays are what meats, plant seeds, and drinks can be carried in. They are mostly flat with raised edges to keep the product in place, and are made of various materials such as paperboard. Like trays, bags are a common form of food packaging. Most commonly known are bagged snacks (chips, pretzels) and fruit (apples, potatoes). “Bagging” separates the food from the environment, namely the air. Boxes are used for the most easy form of transportation of a food product. Most common materials found in boxes are metal, corrugated fiberboard, and wood. Frozen pizzas, cereals, and snack crackers are examples of foods packaged in boxes. Cans are also an excellent way of preserving and transporting foods. Most cans are made of steel or other thin metal when found in stores, as well as glass jars when foods are canned in the home. Boxes and cartons are oftentimes interchangeable. Like boxes, cartons are also made out of corrugated fiberboard and are used for transporting food. 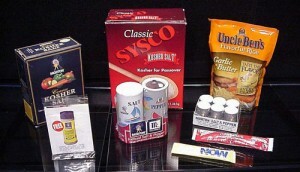 Within the food packaging type of cartons, there are four sub-categories. The most well-known is the egg carton which is molded to the shape of the egg to add protection while the food product is mobile. Aseptic cartons also lie in this category. Examples of this are milk, juice, and soup cartons. Another sub-category of cartons are the folding cartons, which begin as flat pieces of corrugated fiberboard and then assembled by the food manufacturer. Lastly, there are gable tops. These cartons usually hold milk or juice and require the gables at the top to be pinched then pulled in order to be opened. Similar to bags, flexible packaging protects the food protect from the environment and create an adequate means of transporting foods. Bagged salad is a common food found in flexible packaging. Pallets are used for mass transportation of a product. Boxes of the product are placed and stacked on the pallet, then wrapped to secure and decrease food movement. Used for individual items, wrappers provide protection between the food and the environment or the food and a person’s hands. Candy bars are most commonly thought of.